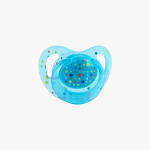 Nuby Printed Pacifier | Blue | �massage and stimulate your baby's gums. Get this silicone pacifier which is designed to fit your baby's mouth perfectly. It helps massage and stimulates your baby's gums. Moreover, it promotes proper teeth alignment by preventing thumb-sucking.